Chicken Satay (RM18) is possibly one of those quintessentially Malay specialities one never tires of eating. No wonder these grilled skewers of chicken take pride of place at Enak KL, the refreshed haven for Malay food at Feast Village, Starhill Gallery. 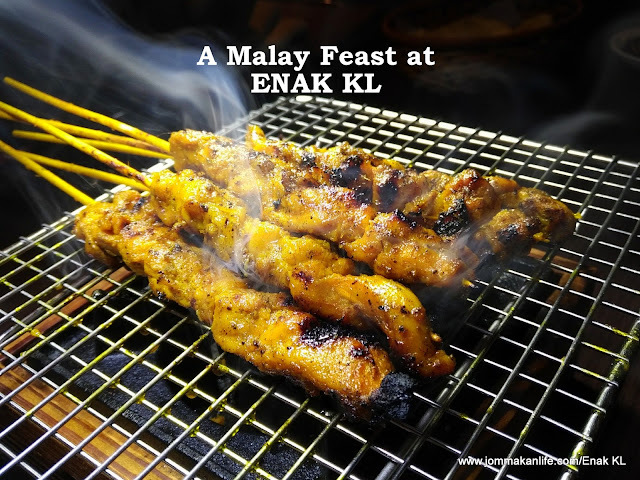 Served with sizzling flair atop a mini charcoal grill, the half dozen skewers of chicken (or beef if you prefer) should be an ideal introduction for foreign visitors to Malaysia's fabulous multi-cultural foodscape. Chef Rani Ghazali does such a great job with the satay that we reckon the tender, well-marinated and subtly smoky-sweet meat tastes delicious on its own. For extra flavour and textural dimension, feel free to dip the skewers into the accompanying chunky peanut sauce, complemented by cubes of nasi impit (compressed rice) and cucumber chunks. Now relocated to a larger premise once occupied by a Middle-Eastern restaurant, Enak KL flaunts a simple, understated and laidback setting. The stone tiled floor sets a rustic stage for old-school fishing traps levelling up as pendant lights and comfy semi-circular banquette seats stowed with plump throw cushions in olive green, lemon yellow and earth tones. Prime the tastebuds with refreshing salty-sweet ambarella juice with preserved plums and local crackers to nibble on. At the behest of our host, Mr Joerg Hontheim, General Manager - F&B Division of Autodome Sdn Bhd, the house speciality of Daging Rusuk (RM61) gets star-billing during our visit. Proof of the daging in this instance is in the eating feasting...we realise the hunk of charcoal-grilled spicy beef rib is indeed swoon-worthy. Again, the chef's wizardry at suffusing the meat with local spices deserves applause as the tender yet toothsome beef stimulates our palate with its profusion of aromatic spice and charred accents. I suggest savouring the meat sans the spicy, thick soya sauce and air asam jawa (tamarind sauce) dips before you return for repeat helpings, enlivened with sauce. Local salads known as kerabu is the norm rather than the exception in Malay cuisine especially in the humble kampung (village) where being a locavore is part and parcel of one's lifestyle. These refreshing offerings make full use of seasonal fruits, vegetables and herbs available in abundance and you'd find a wide assortment of kerabu at Enak KL. Top of the healthy options is our favourite Kerabu Jambu Air Ikan Bilis (RM18). An amenable mixture of sliced rose apples with cucumber, lemongrass and shallots dressed in honey, cut chillies and lime juice, the tantalising salad comes with a generous topping of crispy fried tiny silver anchovies for extra crunch. In contrast, the much touted Kerabu Kerang (RM14) falls short as the few cockles in the beansprouts salad fail to make their presence felt although taste-wise, the inventive dressing of coconut cream, tamarind juice and roasted grated coconut is on-point. Unexpectedly, we find more shine from the rather pale and plain-looking Kerabu Nangka (RM18). Lightly tossed in a smidgen of fresh chilli paste, onion, dried shrimp paste and grated coconut, the combination of young jackfruit and prawns is a masterstroke. If you prefer a more bankable choice, give the zingy-hot Kerabu Pucuk Paku (RM14) or fiddlehead fern shoots with chicken in kaffir lime juice, bird’s eye chilli and roasted grated coconut a whirl. For some beefy broth for the soul, try our local Sup Ekor (RM23). With star anise, cardamoms, cloves and bird’s eye chillies imbuing their warm, rustic sweetness to the hearty oxtail soup, the heartwarming serving is bulked up by chunks of tomatoes and carrot. Besides satay, typical grilled fare such as ikan bakar or grilled fish is also popular in Malay cooking. Enak KL offers several scrumptious variations such as Grilled Grouper & King Prawns (seasonal price) that should please both local and foreign diners. Lightly rubbed with local spices, both the fish and crustaceans manage to float our boat; their inherent sweetness on song at first bite. The famed East Coast speciality of Ayam Percik (RM33) is another go-to grilled offering here. A surefire winsome dish for those partial to poultry once they tuck into the whole butterfly-cut spring chicken slathered with spiced, creamy coconut sauce. Depending on your tolerance level for chilli hotness, compelling mains like Ikan Asam Pedas (RM33) and Sambal Udang Petai (RM42) are de rigueur samplings in Malay dining. The first consists of seabass and okra cooked in piquant, spicy-sour gravy of dried chillies blended with tamarind, laksa leaves and wild ginger. While petai or stink beans may be an acquired taste for some diners, their natural health benefits are now so well-known, they are no longer pauper's food. I highly recommend you relish the tiger prawns stir-fried with chilli paste and stink beans with some Nasi Tomato — rice flavoured with tomatoes, ginger, garlic, star anise and cinnamon or Nasi Biryani — rice scented with cumin, garlic and cloves. Load up on some greens to balance your meal. Popular choices include Kangkung Belacan (RM9), water spinach stir-fried with pounded chillies and shrimp paste or Kailan Goreng Ikan Masin (RM9), stir-fried kale with salted fish. Save tummy space for sweet local treats to wrap up your dining experience. Notable among them are Pisang Goreng (RM14), banana fritters with spicy-sweet thick, dark soya sauce and for the bolder, more adventurous eaters, dive into Serawa Durian (RM18). This lush, unctuous dessert broth consists of durian pulp thickened with fresh coconut milk and palm sugar. At Enak KL, it's complemented by steamed glutinous rice balls and lacy pancakes to capture the dessert's strong, decadent sweetness. Otherwise, safer albeit equally pleasing bets can be found in Air Batu Campur (RM14) — shaved ice confection drizzled with rose syrup, palm sugar syrup and chilled coconut milk over heaps of creamed corn, grass jelly cubes, green rice jelly and red kidney beans or Bubur Pulut Hitam (RM14) — black glutinous rice broth with coconut milk, palm sugar and vanilla ice cream. For reservations, please call ENAK KL, tel: 03-2782-3807. Address: Feast Village, Starhill Gallery, JW Marriott Kuala Lumpur Hotel, Jalan Bukit Bintang, Kuala Lumpur.